Get 15% off fiction purchases in the store! Ready to dive into summer reading? Let us help you find some fabulous fiction! 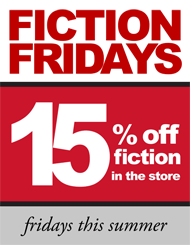 All summer long, fiction purchases at Harvard Book Store will be 15% off on Fridays. The discount will apply to books from the following sections: Paperback & Hardcover Fiction, Mystery, Science Fiction, Poetry, Graphic Novels, Mythology, Fiction & Poetry Audio Books, Beginning Readers, Children’s Classics, Middle Grade & Young Adult. Need a recommendation? Check out the fiction selections on our Staff Recommendations, our Top 100 Books List, or ask one of our knowledgeable booksellers. Please note that this promotion does not apply to used or remaindered titles, already discounted books, or to harvard.com web orders. Fiction Fridays will take place May 22 through September 4.